We specialize in lot preparation and digging foundations. Are you getting ready to build a new home or a shop or a garage on your property? If it’s a permanent structure you’re going to need a company to clear the land and dig out an area for your foundation. 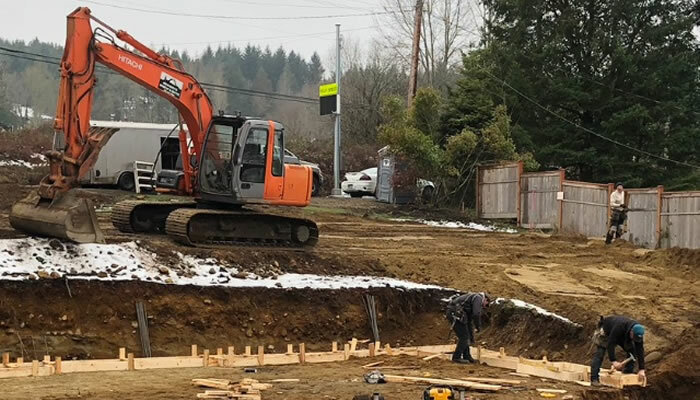 Beaudry’s Bobcat & Septic Service is a Qualicum Beach based excavation contractor that has been serving the local area since 2007. We specialize in digging foundations for residential construction projects like new homes, shops, garages and other outbuildings. Why Choose Beaudry’s For Your Foundation Project? When you choose Beaudry’s Bobcat & Septic for your foundation digging project you are partnering with a small local business that has been serving the Qualicum Beach area for the last 10 years. We rely on our word of mouth advertising from happy clients for our business to grow and your project will be treated with the utmost of attention and care so you’ll be just as happy with our work! If you’d like to receive a Free Estimate to dig out your foundation please give us a call (250) 240-4596 or fill out our contact form and we’ll get right back to you.